At APC, we understand that many of our partners didn’t start their business selling back-up power. With the rise of cloud computing, we’re seeing an increase in Managed Service providers and their expertise is usually networking and IT gear, not necessarily power. When back-up power isn’t your core business, it can be uncomfortable to bring it up with your customers. But we’re finding that many organizations are investing in their networking gear – servers, switches, and routers but ignoring their back-up power. Sound familiar? How many of your customers are buying new Cisco, HP, EMC, NetApp, or Dell equipment but supporting it with a 10-year old UPS? So what are those questions? An easy way to start the conversation is when discussing your customer’s IT gear, ask them what they are doing for back up power – how are they backing up all of this equipment? In some cases, your customer contact may not know, but suggest that you take a few minutes to find out. “It can be as simple as taking a picture of the model and serial number on their exiting UPS,” AJ explains, “from just that, I can tell enough to get started.” The model and serial number of a UPS reveals the general specifications for input/output and load size. It also contains the date of manufacture. However, it’s common for customer requirements to change over time, so it’s possible that your customer may need a different sized UPS – especially if you are adding new servers to their configuration. Or, if they have migrated servers to the cloud, their current UPS may be oversized and they need a smaller one. What’s the wattage of the load that needs to be protected? What are the input and output voltage requirements? 120V? 208V? What are the input plug and output receptacle requirements? How much run time do they need? Do they need a rack-mounted solution or would a tower UPS be ok? Armed with this information, your PDR can help you find a UPS that meets your customer’s requirements and with programs such as the Attach Incentive Program (AIP), your PDR can help you get some discounts on APC Smart-UPS. 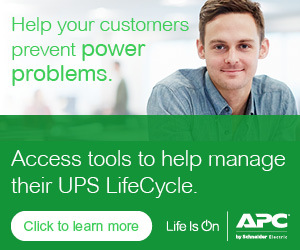 You don’t have to be a power expert to help your customers find a UPS solution that’s right for them. By asking the right questions and taking advantage of the product knowledge your PDR has, you can make recommendations to your customer with confidence. For more information about Smart-UPS, visit our website. To learn more about the discount and incentive programs available for APC partners, visit your partner page or contact your PDR. Don’t know who your PDR is? You can call our Preferred Partner Support Line for assistance: 1-800-771-1APC.